According to figures by research firm Gartner, Samsung once again holds the top spot when it comes to global sales of mobile phones. The Korean-based company managed to bump Nokia from its perch after sales from the former king of handsets dipped more than 3 percent in Q1 2012. 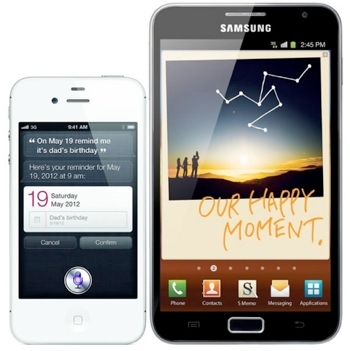 Samsung accounted for 20.7 percent of all mobile phones sold while Nokia bottomed out at 19.8 percent. Apple slipped in under the two with 7.9 percent. Samsung also holds the crown for Android handsets, accounting for 40 percent of all mobile phone sales within the Android ecosystem. The company's closest competitor accounted for less than 10 percent. Android shipped on 56 percent of all mobile phone sold while Apple's iOS trailed with 22.9 percent of the market. Those figures make Microsoft's Windows Phone 7 and Blackberry OS seem downright exotic with only 1.9 percent and 6.9 percent of the market, respectively. Although global sales of handsets were down by 2 percent to 419 million units total, Microsoft and RIM a disproportionate beating. Despite WP7's generally warm reception by Techspot readers and critics, it seems Microsoft just can't gain traction. WP7 saw yet another decline in Q1 2012, but this time by a substantial 27 percent. Meanwhile, sales by RIM also tumbled by a whopping 47 percent. Don't count Nokia, Microsoft and RIM out just yet though. It is important to note that Q1 sales do not include the Lumia 900, a well-liked, high-profile WP7 handset which is expected to boost sales. RIM has also announced it is refreshing its line-up with new hardware and a brand new operating system in an effort to regain its relevance in the mobile market.